The Village of Mannville is surrounded by scenic river valleys and beautiful rolling fields. 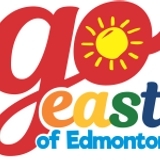 This community of over 828 is located almost two hours east of Edmonton at the junction of Highway 16 and Secondary Highway 881. ATTRACTIONS & EVENTS Mannville is a popular destination for history buffs with unique museums and artifacts around the community. Mannville is home to the first AGT building in Northern Alberta, which is now the Mannville Historical Telephone Exchange Museum. This is the only one of its kind in the province to have a working 1240 Northern Electric switchboard, built in 1917. Commemorative homesteaders' plaques and military cenotaphs can be seen throughout the village. In 1967, a World War II (1942) anti-aircraft memorial gun arrived from Winnipeg, Manitoba and is now a landmark anchor to Main Street. Visit the Mannville Crossroads Museum to view an amazing doll collection from around the world and learn about the history of the area. In October, seniors are honoured at the annual Old Timers Roundup supper and dance. In December, the Christmas Extravaganza is a craft show you won't want to miss. 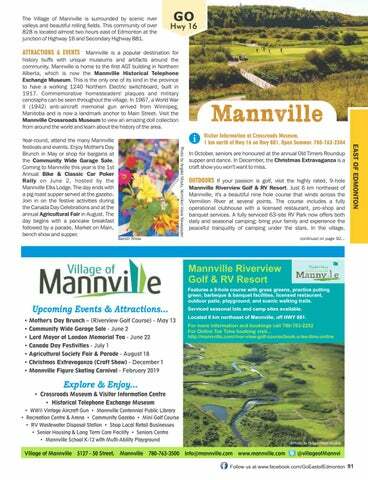 Year-round, attend the many Mannville festivals and events. Enjoy Mother's Day Brunch in May or shop for bargains at the Community Wide Garage Sale. Coming to Mannville this year is the 1st Annual Bike & Classic Car Poker Rally on June 2, hosted by the Mannville Elks Lodge. The day ends with a pig roast supper served at the gazebo. Join in on the festive activities during the Canada Day Celebrations and at the annual Agricultural Fair in August. The day begins with a pancake breakfast followed by a parade, Market on Main, bench show and supper. Mannville Riverview Golf & RV Resort Features a 9-hole course with grass greens, practice putting green, barbeque & banquet facilities, licensed restaurant, outdoor patio, playground, and scenic walking trails. Serviced seasonal lots and camp sites available. Located 6 km northeast of Mannville, off HWY 881.